U.S. Secretary of Defense James Mattis, left, greets Georgia's Defense Minister Levan Izoria during a NATO defense ministers meeting at the Alliance headquarters in Brussels, Belgium, Oct. 3, 2018. U.S. and Georgian defense ministers met in Brussels Wednesday to reaffirm the long-standing defense relationship between the countries. Defense Secretary Jim Mattis was in Brussels to reassure European allies of America’s “iron-clad” commitment to NATO, as the trans-Atlantic alliance prepares for its biggest military exercises since the Cold War. Meeting with Georgian Defense Minister Levan Izoria, Mattis remarked on the South Caucasus nation's exemplary defense reforms and contributions to the NATO Resolute Support mission in Afghanistan, where Tbilisi’s 870 uniformed troops represent the world’s largest per capita contributor to the mission. A Pentagon readout of the meeting said the ministers agreed to continue deterring Russian aggression through U.S. security assistance, and support defense initiatives to develop long-term readiness and NATO interoperability. Mattis also reinforced long-term U.S. commitment to Georgia’s sovereignty and territorial integrity. A photo taken Aug. 1, 2018, shows Georgian President Giorgi Margvelashvili speaking during an AFP interview in Tbilisi. Outgoing Georgian President Giorgi Margvelashvili recently told VOA’s Georgian Service that despite a quarter century of solid ties with the United States, he’s pledging to make increased demands for U.S. military support and development aid, and that he hopes to see the current administration re-engage the world community as a guarantor of global security. 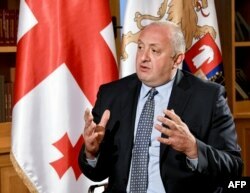 Touting what he called a decades-long “dynamic and close bipartisan relationship” with Washington, Margvelashvili pointed to the U.S. refusal to acknowledge Georgia’s Russian-occupied territories of Abkhazia and South Ossetia. “Even with the current administration, let me just register that our record has been pretty impressive,” he added, citing budget procurements and expanded weapons sales. In September 2017, the Senate Appropriations Committee spending bill increased Georgia’s foreign military aid to $35 million for FY 2018, up from $30 million in 2016. He also said he’d like to see Tbilisi’s NATO membership process expedited. “I’m a very strong believer that we have to be more resilient and more equipped and more organized with a growing threat of the Russian Federation in the region, and maybe even globally,” he said. With U.S.-European ties at a low point, exacerbated by President Donald Trump's recent United Nations General Assembly screed against a “globalist ideology” in which he called an isolated U.S. a “stronger, safer, and richer country,” Margvelashvili argued that history tells a different story. “We saw Ronald Reagan bring down the Berlin Wall. We saw a strong U.S. stance on stability and global security. And those were the impulses that determined the (outcome and aftermath) of the Cold War,” he said. The result of a strong U.S. stance on global security, he added, was the creation of a “more secure and more prosperous” U.S. and Europe. Like “other countries ... we are waiting for a more resilient and organized and strong (U.S.) stand that will ... be accepted by Europe and will solve issues like Georgia and Ukraine,” Margvelashvili said. NATO Secretary General Jens Stoltenberg speaks during a NATO defense ministers meeting at the Alliance headquarters in Brussels, Belgium, Oct. 3, 2018. According to NATO Secretary General Jens Stoltenberg, the Trident Juncture 18 exercise, which will be conducted in Norway in October and November, will draw in 45,000 troops and represent the biggest movement of NATO personnel and vehicles since the 1991 collapse of the Soviet Union. While huge in scale, the Juncture 18 operation will be far smaller than the Vostok-18 exercise staged by Russia and China last month, which involved 300,000 troops and 1,000 aircraft. 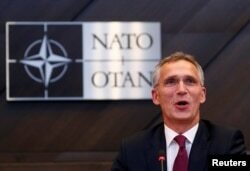 NATO’s effort will involve troops from Britain, North America and continental Europe, equipped with 150 aircraft, 70 vessels and around 10,000 land vehicles. This story originated in VOA's Georgian Service.